The Hides Hotel Cairns offers delightful family, couple and corporate accommodation right in the city centre of Cairns. 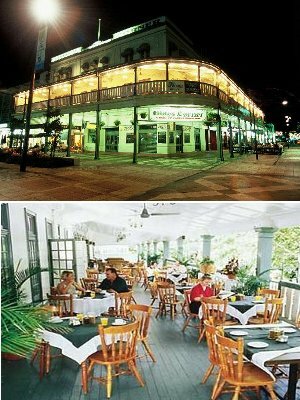 It is a heritage listed building, that was originally constructed in 1885 and has since been restored in 1997, adding the comfort and convenience of modern rooms, while retaining the old world colonial charm. The wide colonial verandas that front the Hides Hotel provide a unique vantage point to view the city of Cairns. It also provides you with the perfect place to enjoy your free continental breakfast each morning. This accommodation hotel also provides a great base from which to explore the numerous attractions that Cairns and Far North Queensland have to offer, including the Great Barrier Reef, the Daintree Rainforest, Mossman Gorge and the restaurant precinct along the Cairns Esplanade. Your Cairns accommodation room at the Hides Hotel will be either one of the heritage listed budget style hotel rooms with shared facilities or a discount motel style room complete with ensuite bathroom. Either way you are sure to enjoy your stay in Cairns at the Ocean Hotels Hides Hotel because your room has everything that you will need and the friendly staff are always there to help you with any enquiry that you might have. Queen Hotel Room - This hotel room features a Queen Bed, private enquite facilities, air-conditioning, TV, phone, refrigerator, wireless internet, tea/coffee making facilities and fridge. Superior Hotel Room - This 3.5 star hotel room features a Queen & Single Bed, private enquite facilities, air-conditioning, TV, phone, refrigerator, wireless internet, tea/coffee making facilities and fridge. Family Hotel Room - This spacious family hotel room features a double & 2 single beds, private ensuite bathroom, air-conditioning, fridge, TV, phone, wireless internet, tea/coffee making facilities and hair dryer. Heritage Double Hotel Room - This 2.5 star heritage hotel room features a Queen Bed, TV, wireless internet, tea/coffee making facilities, air conditioner, fridge and shared bathrooms facilities close by. Heritage Twin Hotel Room - This 2.5 star heritage hotel room features a 2 Single Beds, TV, wireless internet, tea/coffee making facilities, air conditioner, fridge and shared bathrooms facilities close by. Heritage Bunk Hotel Room - This 2.5 star heritage hotel room features 1 Set of Bunk Beds, TV, wireless internet, tea/coffee making facilities, air conditioner, fridge and shared bathrooms facilities close by.